We sell Mosiguard natural mosquito and sandfly repellent. Mosi-guard is natural and DEET free. The natural ingredient is Citriodiol ®, a naturally occurring extract of lemon eucalyptus oil. It is long-lasting, effective, and feels refreshing on the skin. Please email or ring me if you have any questions. I am a repeat buyer because it works on both sandflies and mosquitoes. We camp with children along the coast of central qld and this product matches any other DEET product in its ability to deter Sandfly’s and mosquitoes. Mosiguard is unbelievable! We. ( my husband and 10 year old son) travelled through India and went on a tent safari in Rhajastan, I was worried about malaria & Denge so researched for a natural repellent online discovering Mosiguard. The mosquitoes were out of control on safari and I remember my son standing outside the tent in a cloud of mosquitoes laughing as they bounced off his skin. It was incredible! We managed to stay bite free for the whole trip. No nasty deet and totally effective! My office and home are right on the beachfront so mozzies and sandflies are prolific and they LOVE me. I hate the idea of applying deet on a daily basis and can’t stand the smell of the toxic insect repellants. Tried mozzie guard for the first time a few months ago and it definitely works. It works even better than some of the toxic products. The smell took about a week to adjust to, its very pleasant but very strong. I would say it wouldn’t bother most people as people often comment on “what smells so nice” so I think I’m just very sensitive to strong smells. I’m glad I persevered though as after 1 week the smell didn’t irritate me at all and it has a lovely cooling sensation, plus, leaves my legs feeling moisturised. I apply it 3 times per day over a 10 hour shift and if I forget, I know about it! I also use it early morning when I run or go to yoga and have recommended it to many friends and guests. It's so good - I'm ordering more!! We have a courtyard with bamboo and is very shady and mossie's are a real problem - they almost swarm as we step outside. Shortly, we are moving to our own apartment which is in an area known for sandflies. When we have walked by the river near our new apartment, I came away with multiple sandfly bites which flare up the next day, are SO itchy and take weeks to heal. So when I found Mosiguard on the internet, I thought I'd give it a try, as I won't disrespect my body by smothering it with chemicals. Mosiguard works a treat!!! I go out into our courtyard and see the mossies flying around me, but I no longer get bitten. We went to the river near our new apartment and again - no bites. My Mum came with us near the river and got bitten, so I gave her my spare mosiguard and it took the itch away from the bite and she didn't get any more bites through the evening. She loved it so much, she took it home with her - so I'm back to order more. Thanks guys for the great product and great service!!!! I love Mosiguard - took it to Myanmar in the wet season and it really works. I'm very sensitive to chemicals and this is the only repellant I've been able to tolerate so far. The service here is amazing - my order arrived so quickly. Thank you! Chemical free repellent that really works and is long lasting. 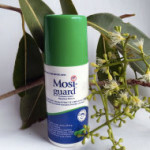 The mosquitos and sandflies can be vicious in my area and Mosi-Guard works a treat! Will be buying more! Works - even in the Borneo jungles! I was concerned about mosquito born diseases and other bitey insects for our planned trip to Borneo, so I researched non-chemical insect repellents. Mosi-guard had great reviews and scientific research to back it up. So I bought some for our trip and was extremely pleased - it even worked at repelling the voracious leeches in the jungle. I have used this ever since - in Cape York, the Kimberley and in the backyard! It just works. A great product that is very effective - much more so than all other natural products that we've tried. Anyone who has kids should be using this on them, no question. It's now completely replaced our chemical-based repellents so many thanks for waving the flag for healthy alternatives! Great service - arrived in the mail only 2 days after order in FNQ! What a great natural product, safe to use on families. Mosiguard protected our family when we had problems with midges and sandflies. The one time I forgot to use it I got bitten like crazy! Thank you Seamus for your prompt replies and processing my order so quickly. Much appreciated.